Supreme value of youth period is incalculable and indescribable. Youth life is the most precious life. Youth is the best time. The way in which you utilize this period will decide the nature of coming years that lie ahead of you. Your happiness, your success, your honor and your good name all depend upon the way in which you live now, in this present period. Remember this. This wonderful period of the first state of your life is related to you as the soft wet clay in the hands of the potter. Skillfully the potter gives it the right and correct shapes and forms, which he intends to give. Even so, you can wisely mould your life, your character, your physical health and strength, in short your entire nature in any way in which you make up your mind to do. And you must do this now. O fortunate youth, recognize this great duty. Feel this wonderful privilege. Take up this adventure. God watches you graciously, ever ready to help and guide. I wish you to be great. The world has put its faith in you. Your elders keep their hopes in you. Now youth means to place your firm confidence in yourself and exercise your hopeful determination and resolution and willing good intentions in this beautiful task of self-culture. This will truly bring supreme satisfaction and fulfillment not only to you, but also to all concerned. The shaping of your life is indeed in your own hands. Practise virtue, persevere in virtue. Become established in virtue. Shine as an embodiment of noblest virtue and heroic adherence to goodness. Youth is meant for this grand process. Youth life is the active development and fulfillment of these processes. This period of your time provides the suitable and favourable fields for the working out of this extremely important and most indispensable process in life. This is the special significance, the great importance and supreme value of youth life. It signifies the creation of noble personality. It is atma-Viakasa. It is Atma –Nirmana. Please try to understand the correct implication of the term successful life. When you talk of success with reference to life, it does not merely mean succeeding in everything that you undertake or do; it does not merely mean succeeding in fulfilling all wants or getting whatever you desire; it does not just mean acquiring a name or attaining a position or imitating fashionable ways appearing modern or up-to-date. The essence of true success is what you make of yourself. It is the conduct of life that you develop, it is the character that you cultivate and it is the type of person you become. This is the central meaning of successful living. Therefore, you will see this important matter is not so much a question of success in life. ( Jivan – Me- Safalta) but rather it is success of life. Such successful life is one that succeeds in producing an ideal individual, a noble man. Your success is not measured in terms of what all you obtained but in term of what you become, how you live and what actions you do. Upon this point reflect well and attain great happiness. In our grand culture they conceived of life in four stage-preliminary stage, development stage, flowering or blossoming stage and the culminating fruitful stage. These can be described as he preparatory period, the practising period for the satisfactory growth of the latter stage. Yours is the stage of preliminary preparations for right and successful living. Herein is its supreme value and great importance. This is like the ploughing and sowing of seeds in the field by a farmer. Now, you can easily understand, what is the significance and importance of this in connection with the harvest, which any one would wish to reap later on. And also, it is like the laying of the foundation for an important building you wish to construct. If this building is something very important to you, then you just think how much more important its proper foundation becomes in your view. The strong and continued existence of the building depends certainly upon the foundation. This is the stage you are now in. Let your preparations be wise, correct and of such kind that will lead to your true welfare, supreme good and lasting satisfaction and happiness. This must engage your active, enthusiastic attention throughout the period of your youth life. Our culture refers to this stage as the Brahmacharya Ashram or Vidyarthi Jivan. Here, you acquire knowledge of not only subjects like History, Geography, Mathematics, etc., but also about human nature, correct Vyavahara, science of Self- control, art of developing pure mind, Dharma, the duties of man and the proper relationship between you, your family, your society and the world. 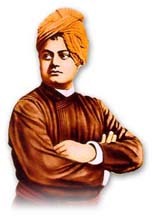 As we are celebrating the birthday of Sri Swami Vivekanandaji Maharaj; I would like to narrate one anecdote from vedas. Once upon a time lord Indra was holding a court; he found a divine person with radiating light (Embodiment of Spirit) was just walking towards his court; seeing him Indra’s arm guards gave up their weapons; they prostrated that Embodiment of Spirit. Gods and Goddess started to adore him. In the utmost surprise of all even King Indra also came down from his celestial throne and requested that supreme personality to come and occupy the throne. Indra was puzzled. He didn’t know, what to do then! He sought the advice of his guru, the great Prajapati who asked Indra to go back to that Embodiment of Spirit and serve him. Indra served sincerely year after year and after a long time one day he enquired, “O Indra, what are you seeking?” Indra respectfully replied, “Oh Adorable One, I want to know about the power you possess, because of that without having any weapon like Astra, Sastra, or Army you are able to control Bhu, Bhuba, Swar, Gan , Tapa, Satya and so many lokas.” “Oh Indra it’s very small matter; It’s only due to my character and virtue! I am very happy with you; I want to give a boon to you; please ask anything other than Indra’s kingdom or Indrasan”., declared the Embodiment of Spirit. Embodiment of Spirit said, “So be it to you!” With great sound and shock one after another, five bright rays of light came out of his body and entered in Indra’s Body and with that he (Embodiment of Spirit) was thrown out of the Indrasan. Last ray declared that you have given your character and virtue to Indra; where there is character and virtue; lies power, wealth and wisdom! May you all shine and prosper! May you all live and lead the life of purity, character and virtues. Be vigilant and diligent with your actions, sincere in your efforts and regular in your spiritual practices. May you all achieve this and uplift the nation, which was the desire of Swami Vivekanandaji. The idea behind the celebration of Sri Swamiji Maharaj’s birthday is to fulfill his dream!